GAZA KINGPIN ISMAIL HANIYEH LOSES INTERNAL TACTICAL FIGHT WITH MASHAL AS HAMAS DITCHES ASSAD…….. – The Tundra Tabloids……. 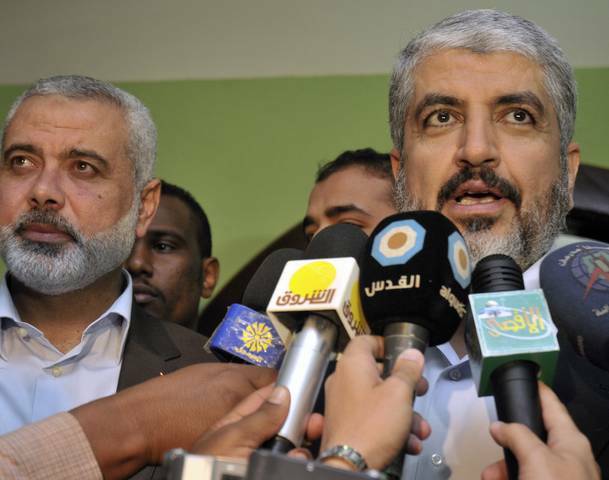 GAZA KINGPIN ISMAIL HANIYEH LOSES INTERNAL TACTICAL FIGHT WITH MASHAL AS HAMAS DITCHES ASSAD…….. Professor Barry Rubin was right. It’s all about the struggle for the leadership of Hamas and eventual influence over the direction of the entire P.A.. Barry Rubin spelled it out here. Mashal wants accommodation with Abbas, Haniyeh deems it a sell out, and a credible threat of encroachment upon his fiefdom in Gaza. He was recently in Tehran trying to beef up his support with the Mullah regime, while Mashal has been plying the Eyptian Muslim Brotherhood with overtures and nods of solidarity. “I salute all the nations of the Arab Spring and I salute the heroic people of Syria who are striving for freedom, democracy and reform,” Hamas leader Ismail Haniyeh, visiting Egypt from the Gaza Strip, told thousands of Friday worshippers at Cairo’s al-Azhar mosque. “We are marching towards Syria, with millions of martyrs,” chanted worshippers at al-Azhar, home to one of the Sunni world’s highest seats of learning. “No Hezbollah and no Iran. Barry was spot on in his analysis, why the media continues to seek out 3rd rate analysis instead of turning to him, is for others to expound upon. I feel that they just can’t handle the truth. CAIRO/GAZA, Feb 24 (Reuters) – Leaders of the Palestinian Islamist movement Hamas turned publicly against their long-time ally President Bashar al-Assad of Syria on Friday, endorsing the revolt aimed at overthrowing his dynastic rule. The policy shift deprives Assad of one of his few remaining Sunni Muslim supporters in the Arab world and deepens his international isolation. It was announced in Hamas speeches at Friday prayers in Cairo and a rally in the Gaza Strip. Hamas went public after nearly a year of equivocating as Assad’s army, largely led by fellow members of the president’s Alawite sect, has crushed mainly Sunni protesters and rebels. In a Middle East split along sectarian lines between Shi’ite and Sunni Islam, the public abandonment of Assad casts immediate questions over Hamas’s future ties with its principal backer Iran, which has stuck by its ally Assad, as well as with Iran’s fellow Shi’ite allies in Lebanon’s Hezbollah movement. “I salute all the nations of the Arab Spring and I salute the heroic people of Syria who are striving for freedom, democracy and reform,” Hamas leader Ismail Haniyeh, visiting Egypt from the GazaStrip, told thousands of Friday worshippers at Cairo’s al-Azhar mosque. Previous Post Previous Post SEVEN DIE IN KORAN BURN PROTESTS……..
Next Post Next Post CURRENT SECRETARY OF THE TREASURY PROMOTES CLASS WARFARE ON NBC…….